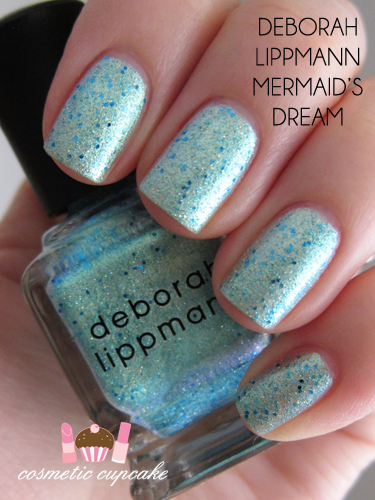 A quick swatch for you today of Deborah Lippmann Mermaid's Dream which I picked up recently while I was in Hong Kong. I am a sucker for her polishes and it takes every ounce of my self control not to go crazy and just buy every single one of them!! Mermaid's Dream is a shimmery pale green/blue foil with gold and blue glitter through it. It is just gorgeous and really reminds me of mermaids and the sea. It's pretty pigmented so you could get away with 1 thickish coat but I used 2 coats which is pictured here. It dries to a gritty finish so I suggest a thick topcoat. I picked this up from Joyce Beauty in HK but you can purchase it from Nordstrom, Neiman Marcus or Kiss and Makeup NY. I guess sometimes those expensive polishes definitely worth the price. Beautiful nail polish, love the glitter! It really does take a lot of self-control not to go nuts at the Lippmann counter! This is one of hers that I just had to have, though, and I don't regret it a bit. Looks beautiful on you, Chelle! This looks lovely on you! I kind of like the finish of this polish without topcoat, it's very unique! I love it! A different color that fits you perfectly!